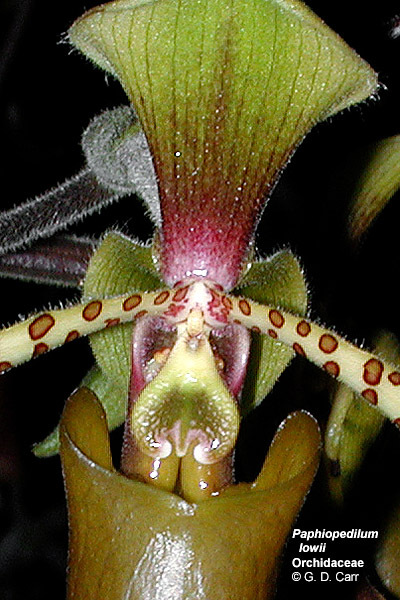 Orchids in subfamily Cypripedioideae have two stamens, one on each side of the column. 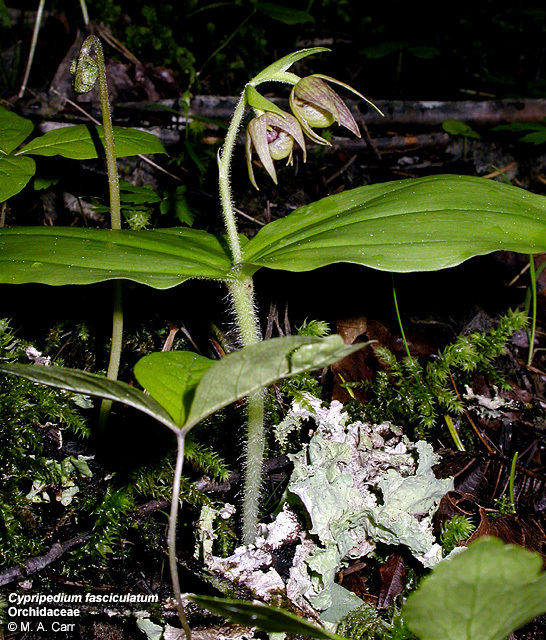 Pollen is granular. 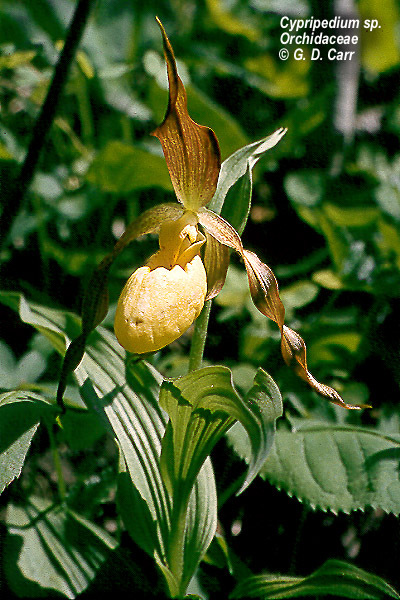 Cypripedium calceolus, yellow lady's slipper - Colville Natl. 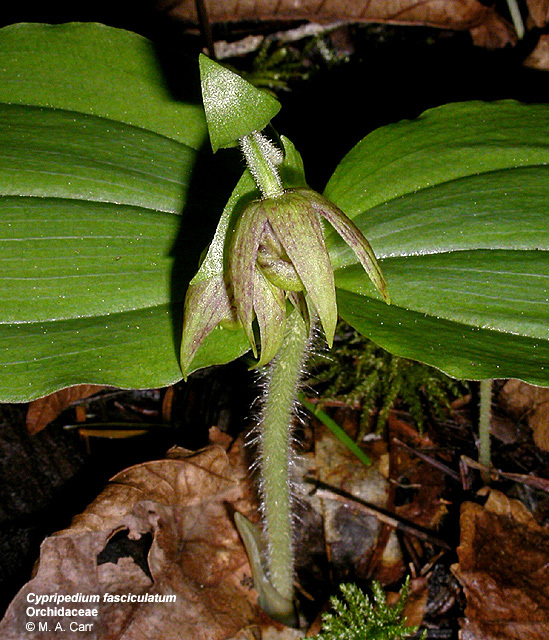 Forest, Washington. 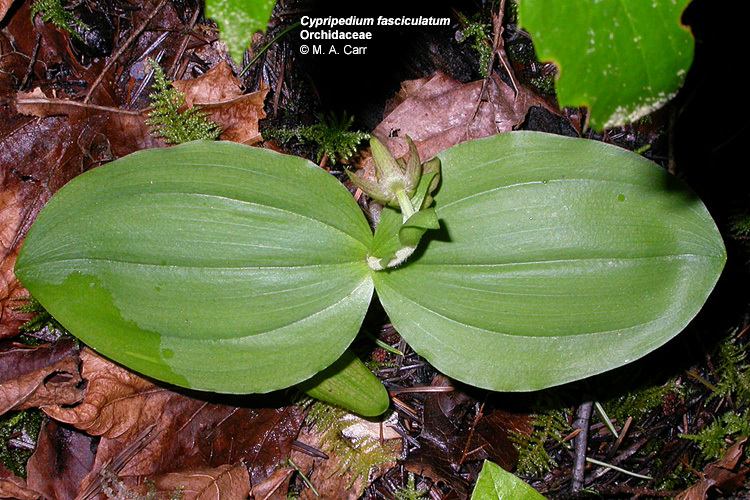 Cypripedium fasciculatum, clustered lady's slipper, Umpqua, SW Oregon, April, 2003. 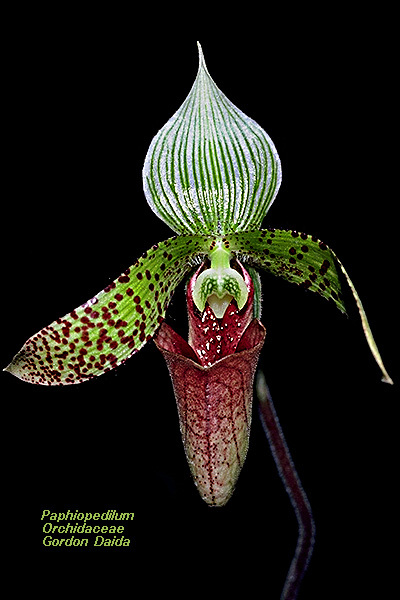 Paphiopedilum houghtoniae. 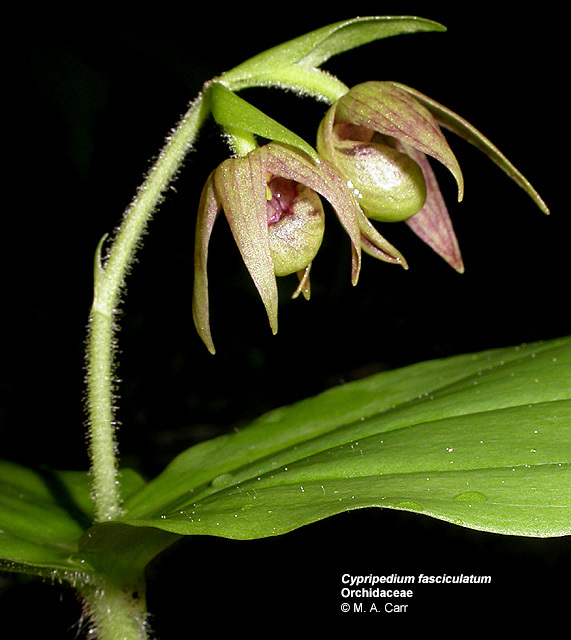 Side view of column showing one of the two lateral stamens. 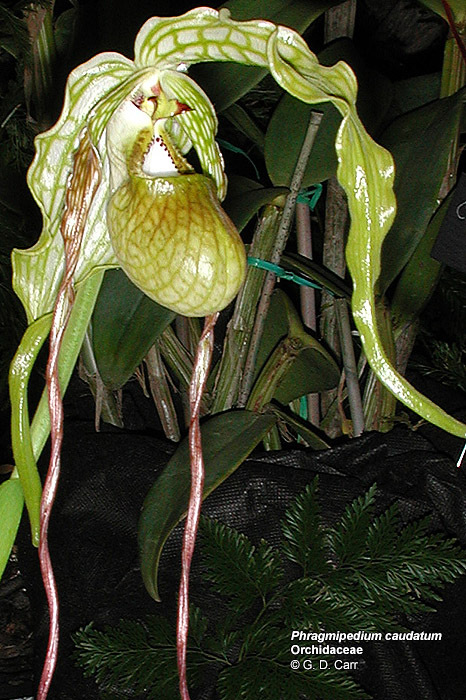 Paphiopedilum Julius hybrid. 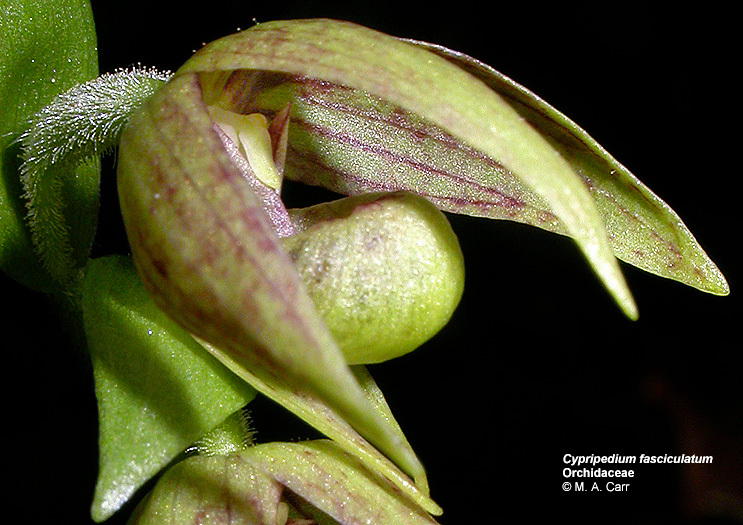 The second photo shows an oblique view of the column with one of the two lateral stamens in view. 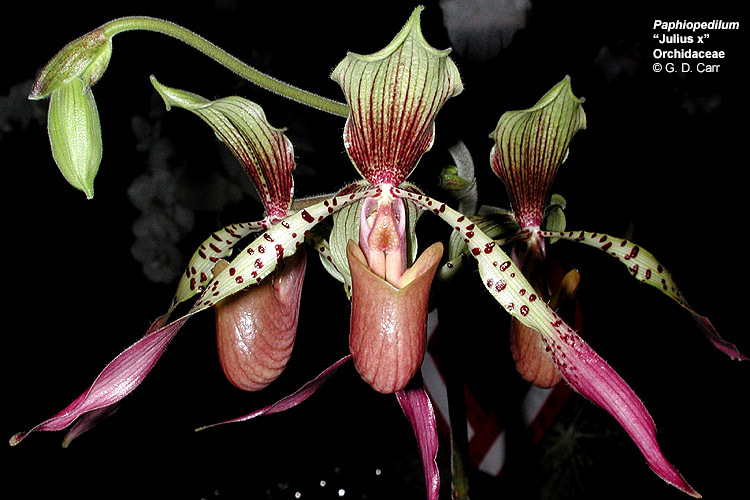 Paphiopedilum lowii. 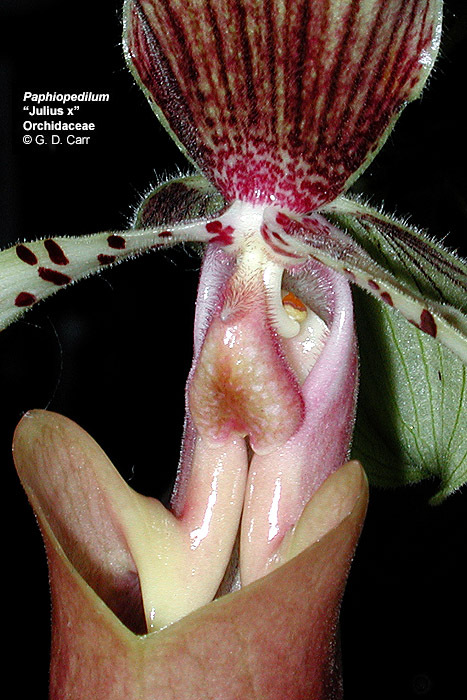 One stamen is visible on each side of the column. 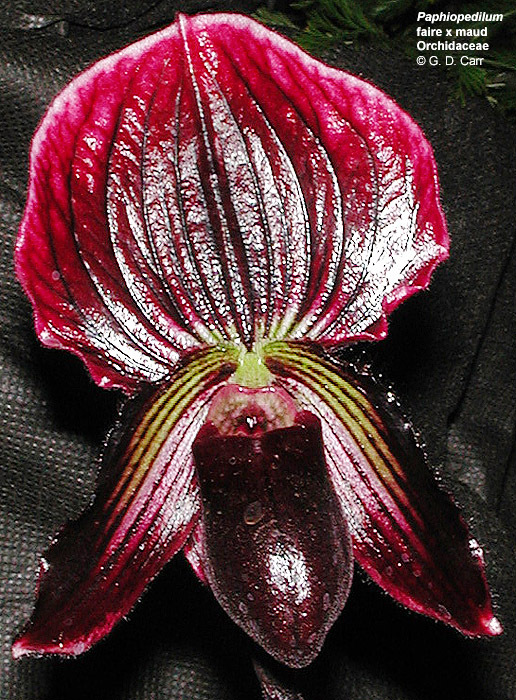 Paphiopedilum Prince Edward of York. 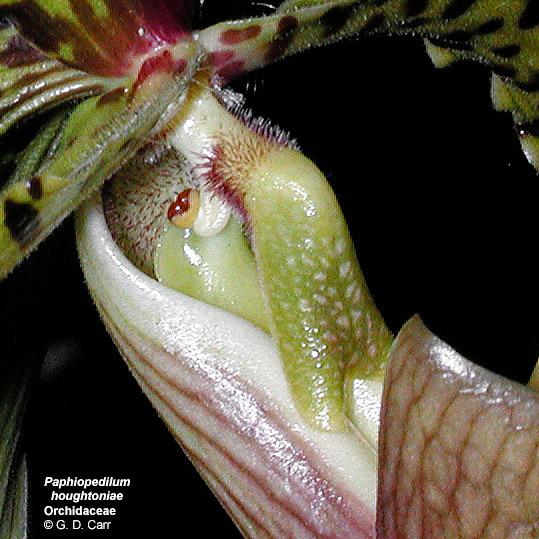 Parts of both stamens are visible in the lateral view of the column in the second photo. 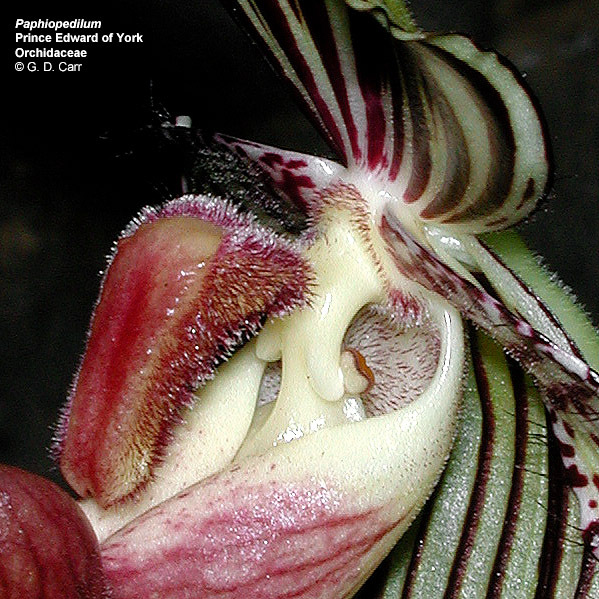 Paphiopedilum sp. 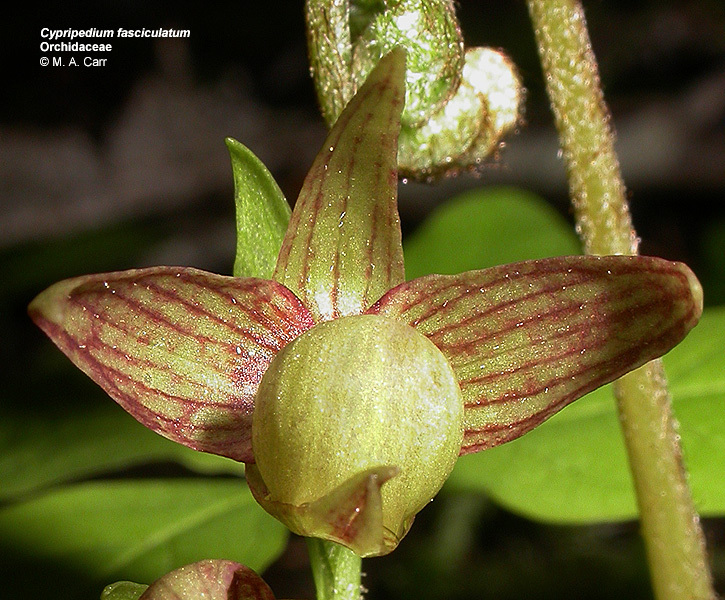 A broad, green and white striped sepal is at the top of the flower. 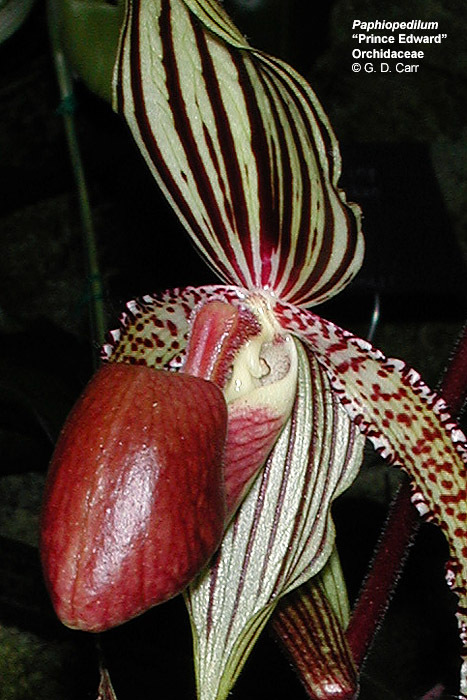 Two red speckled petals extend left and right. 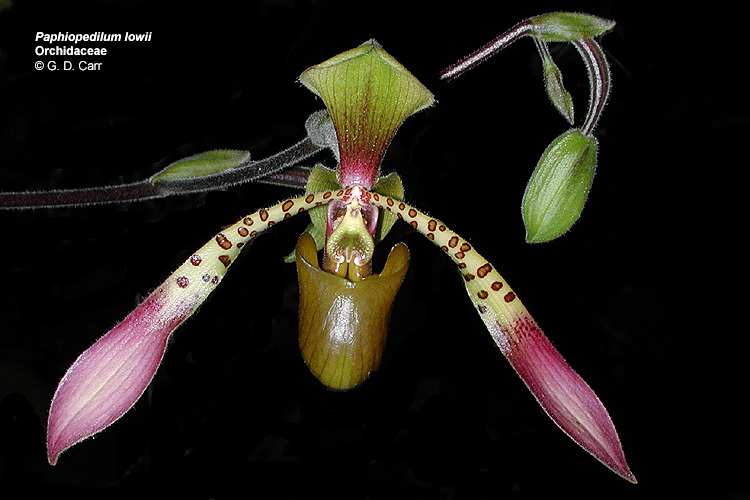 The third petal is very highly modified and forms the large pouch-like labellum at the bottom of the flower. 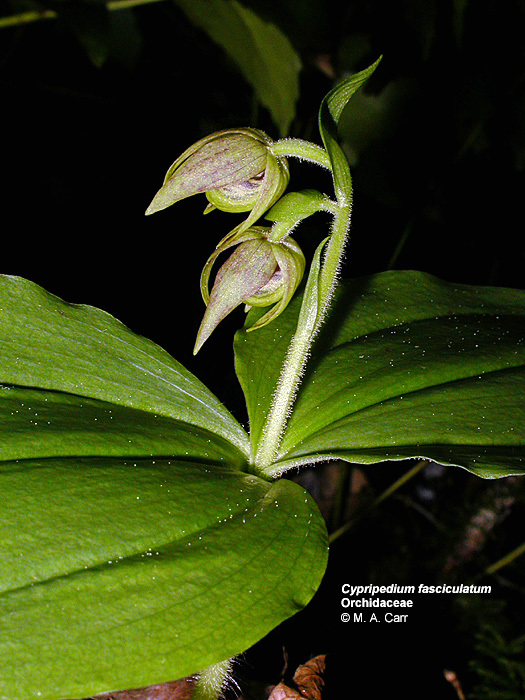 The column is green and white, extending from the center of the flower. 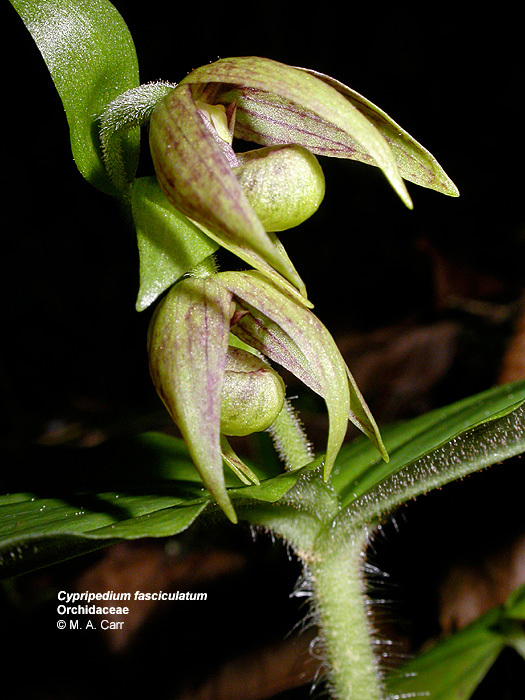 One stamen is adnate to the lower surface of each of the greenish lobes of the column. 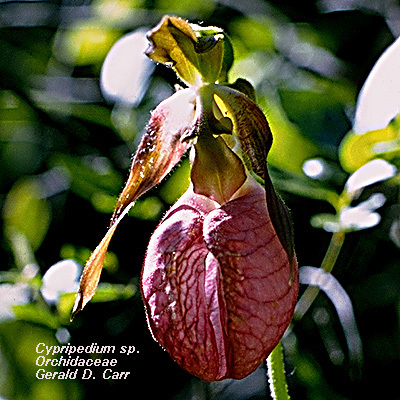 A portion of one of the two smaller green sepals is visible just to the right of the column.